For future reference the Wikipedia:CIA World Factbook 2002 import can be found at Talk:Papua New Guinea/CIA World Factbook 2002 import. combining Madang and Huon Gulf into one region called Madang-Morobe. Port Moresby (region) (renamed as South?) should include the small area of the mainland which is officially in Milne Bay region. For travel purposes that makes no sense. It would then make sense to rename Milne Bay to Milne Bay Islands. I think Manus and New Ireland could sensibly be one offshore region, Manus and New Ireland. Here is the map and region scheme with my suggested amendments. As it involves changes to an existing scheme, I will leave it here for a while, hoping for comments. Are you happy with the four offshore regions? The only change I suggested was to merge New Ireland and Manus into one region. Mainland PNG is more tricky I think. I do not understand your point: "SW PNG; South PNG and Milne Bay (and, I think, Oro) make up Papua". Could you expand on that please? 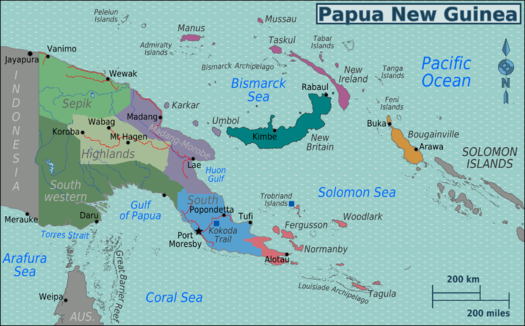 What does Papua mean in the context of just those provinces? If we create one south coast region, it will be truly vast (about 700 miles across). We would also need to split Western Province, as some of the most unexplored, inaccessible hinterland anywhere on earth could not logically be in a region called South Coast. I would strongly suggest that mainland Oro and Milne Bay should be in the same region as Port Moresby. Otherwise we end up with Moresby, Kokoda and Tufi in different travel regions. Milne Bay mainland and Milne Bay Islands are not very related from a travel viewpoint, and it makes sense to me to have the islands dealt with as a separate region. I can see the sense of a north coast region which consists of both Sepiks and Madang. But where does that leave Morobe? The Huon Gulf area cannot really be thought of as north coast which is why I suggested the Madang-Morobe and Sepik scheme to cover this part of the country. South instead of South Coast?? Combining these makes sense. Eastern PNG? Can't agree to splitting Milne Bay from its islands. One, you would split a province into two regions: two, the mainland and the islands must be treated together because you cannot reach most of the islands without going through Alotau on the mainland. Creating arbitrary regions that make sense to the traveller is exactly what we do! Do you really think 20 top level PNG region articles to correspond with the 20 provinces would be useful to anyone, when we only have a handful of destination articles? All that being said, every boundary line suggested in this particular scheme follows an official region boundary. Point taken and I will concede on Milne Bay - so it will be a region with onshore and offshore elements. I have amended the map already to reflect this. The South and Southwest are still problems. I think it needs to be two regions and you don't :). Whenever possible, we try to avoid bland region names when an interesting alternative is available. Don't you think that Madang-Morobe is a better name than Eastern PNG? From a travel point of view, I think there is lots wrong with that division - it was actually the first option I looked at when seeking to adjust the over-complex structure that is already in place. It would I think be both a very lazy and impractical solution. Australia is surely different as it was always clear that we would have 2nd level regions. PNG has them at the moment but that is a bit silly for a country with so few articles. If we divide sensibly at the top level, all the lower level regions can go, and there should never really be any need for further division in the future. Isn't the whole idea that we first start with some logical reasons and then expand them when more destinations become available? I don't know exactly how many destinations PNG currently features, but for now I think 4 would be enough for the country. More regions can always be added later, but 9 now seems to overstretch it. Especially as the 4 regions do make sense I think. Even an enormous country such as DRC only has five regions. I did not mean that we should not create the articles. They can be created. I meant, for travellers, regions in Wikitravel have the goal of cutting a country in chunks so its destinations are easier to find. Making 4 regions with each about 5 destinations is better than making 10 regions including about 2 destinations. 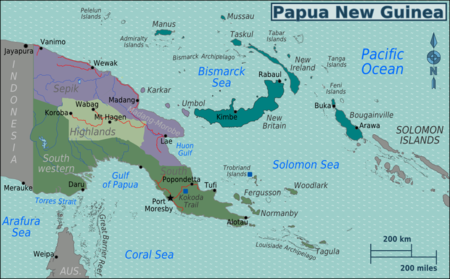 Bougainville should not be a region, because there is only 1 destination article for it. Thus, it is a destination (not a region), and can more easily be grouped among other destinations inside a region. In case Bougainville splits up into, say, 5 destination articles of different towns of the island, then Bougainville could be bumped up and function as a region. The fact that a country is usually divided a certain way should not concern us. I am almost out of energy trying to keep some consistency in this matter but I will have one more go. I am bemused as to why there are objections to treating the PNG islands in the same way as we treat other highly dispersed island groups? I have given lots of examples above so will not repeat them. Nobody has answered those points. Is it not desirable to avoid low level regions if possible? Or is it only Peter and I who think that? Claus, if you really look at the option of 3-5 regions you will see that 2nd level regions would be inevitable. For example... say we have a nebulous "Islands" region. Logically, linking all the city articles straight to that would make no sense for the traveler whatsoever (the region would be 1,000 miles across). Additionally, how on earth could you write Get in, Get around, or just about any of the sections (! ), for that region? My country PNG is an extremely diverse place both geographically & culturally, so the task of regionalising it is particularly difficult. However, it isn't that difficult. PNG embarassingly still doesn't have a map, we just need to plunge forward with something and go with it. I support Burmesedays' divisions into 9 regions. new britain points to new britain in the USA!! Ah OK. I do know that Kava consumption is fairly large in the Eastern islands which are famous for growing what is regarded as the very strongest strain of the stuff anywhere. I wouldn't get too wrapped up in the use of templates. The template used should be whatever is best suited to the destination—not simply matched to the name or type of destination. While the park template is most often best for articles about parks, sometimes a city, region, or even itinerary template (or some combination thereof) might fit the destination better. Islands are an even clearer example—we generally use city templates for them, even if there are no cities on the island! The Appalachian Trail in the U.S. is most certainly an "other destination," albeit an exceptionally long one, as well as a park, but is best covered in an itinerary. Bougainville is indisputably a region, with sub-destinations (villages) to boot, but for our purposes the city template actually works best. This page was last edited on 21 November 2011, at 04:59.